love, laurie: she's a beaut, clark . . .
she's a beaut, clark . . .
. . . 10 points to anyone who knows that reference! this week has been absolutely insane!!! we have had all hands on deck here at the theater to prepare for a humongous gala in our building tonight. 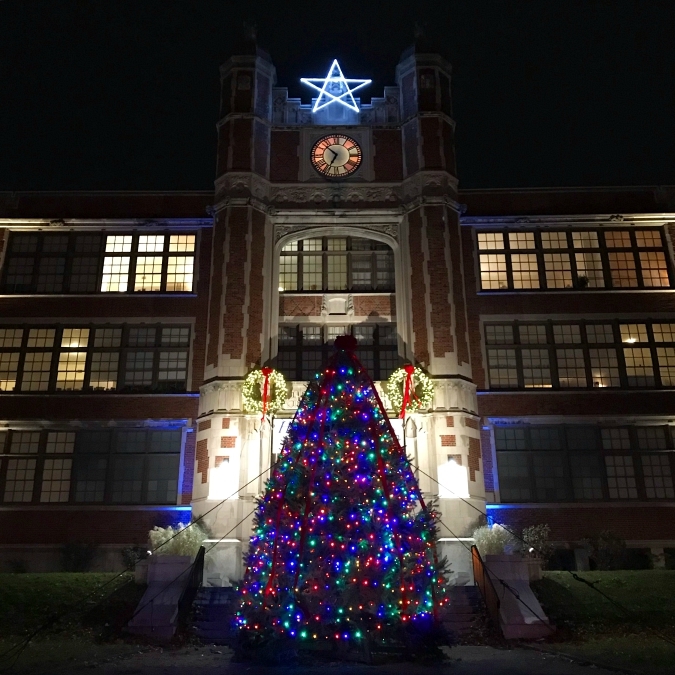 last night after rehearsal the front of the building was decorated for the holiday season. a 20 foot christmas tree was delivered, covered in many lights, and topped with a bow. the ginormous wreaths (which are taller than me) were hung on the building and all of the front up lights were turned blue. wheph! exhausting, and cold, but well worth it for the reveal at the end! fingers crossed that we all survive tonight! Was that a quote by Cousin Eddie in Christmas Vacation? Beautiful tree and wreath. You guys worked hard and the gala turned out wonderful.